eCite - Have plants evolved to self-immolate? By definition fire prone ecosystems have highly combustible plants, leading to the hypothesis, first formally stated by Mutch in 1970, that community flammability is the product of natural selection of flammable traits. However, proving the "Mutch hypothesis" has presented an enormous challenge for fire ecologists given the difficulty in establishing cause and effect between landscape fire and flammable plant traits. 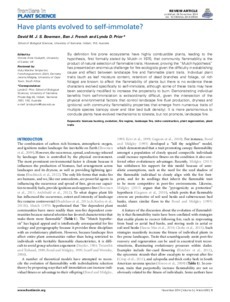 Individual plant traits (such as leaf moisture content, retention of dead branches and foliage, oil rich foliage) are known to affect the flammability of plants but there is no evidence these characters evolved specifically to self-immolate, although some of these traits may have been secondarily modified to increase the propensity to burn. Demonstrating individual benefits from self-immolation is extraordinarily difficult, given the intersection of the physical environmental factors that control landscape fire (fuel production, dryness and ignitions) with community flammability properties that emerge from numerous traits of multiple species (canopy cover and litter bed bulk density). It is more parsimonious to conclude plants have evolved mechanisms to tolerate, but not promote, landscape fire.